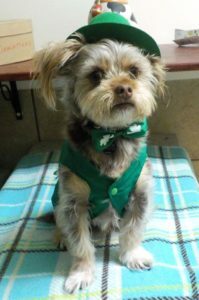 Dog of the Month- March 2017 - Camp K-9 Pet Resort and Spa, Inc.
Coco is dressed to impress for St Patty’s day in his hat, tie and vest. Coco is part of our daycare group and is quite the class clown. He absolutely loves to stare at Sharon while she is working. We enjoy this little guys company each day he is here with us. Next → Next post: Dogs as Athletes: What Sets them Apart?